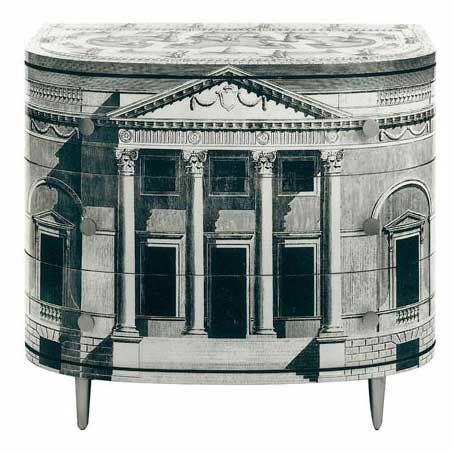 What do Piero Fornasetti and Annie Sloan have in common, you ask? Actually many things. Besides being talented artists in several mediums, they turned their art into a successful business based on their unique visions, ideas, and products. Both focused their talents in the interior design, decorative painting and furniture industries. They both also serve as the inspiration and process for today’s post. Using an image of classical architecture, I traced a simplified outline onto the previously painted chest of drawers from this post. Using the image as reference, Napoleonic Blue Chalk Paint® and a small artists brush, I was able to paint what you see below. I have tried variations on a Fornasetti inspired theme many times before, all disasters. This time I kept it very simple in a primitive style and I think that made a huge difference. The only tricky part was the frame between the drawers. At first I left them empty, but then went back and added a bit to continue the lines. I had removed the knobs, so they weren’t really a problem. And the result? Good enough that I didn’t feel compelled to paint it solid blue. Inspired by Fornasetti, painted with Annie Sloan. Wow! I didn’t think it needed anything but now I see the cake had no icing. I can’t wait to look up Fornasetti. I never heard of him. so sorry.. I don’t understand.. The first thing I thought of when I saw this was wallpaper I bookmarked on Houzz. I went back to look at it and now that I read the description it refers to Fornasetti. Interesting. Looks better on your dresser than in the room I first saw it in. This is amazing. I’ve been a fan of Fornasetti for a long time. I love the way you painted it. Thank you so much, Rita. I can’t tell you how many times I have tried to do something “Fornasetti-like”. He was amazing! Leslie–this is amazing! I love it (I knew I would anyway as I love blue)! I have to confess that I didn’t know who Fornasetti was either–but after looking him up I can tell that I know of his work but didn’t know his name. The dresser is brilliant. I love the contrast of the drawers with the frame. You did an amazing job on the artwork. It is so neat! I hope this gives you confidence to try something else like this. Are you going to keep this or sell it? Thanks for showing us! Wow. Traditional lines, yet such a fresh, modern perspective. Congratulations, Leslie. It is a triumph. Perfect….. And I love the little center key holes? With the lightest blue….